I do dislike these ‘point 1’ issues, but when the content is as good as this I’m happy to pass over that minor cosmetic flaw. 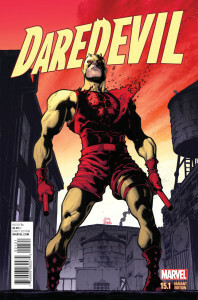 The events contained within occur before issue #15 (massive turning point, important distinction to make) and chronicle some of Daredevil’s early exploits as told by Murdock for his autobiography, Marc Guggenheim pens the major flashback, Samnee debuts his writing talents with a backup and Waid fills in all the spaces in between. Guggenheim writes a grittier, darker story that really seems to grasp one of the key points of Daredevil, the whole lawyer/vigilante combo, and it’s quite entertaining. Samnee’s offering is fairly straight forward and felt influenced by Waid, not that that’s a bad thing by any means. Art is smooth throughout, changing with the writers but remaining of a high quality. This was a nice dip into Daredevil’s past with a nod to current events before things really light up (I assumr) in the next issue proper.